W-doped VO2 films have been synthesized via oxygen annealing of V–W–V (vanadium–tungsten–vanadium) multilayered films. 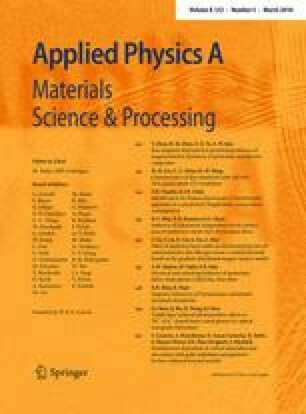 The effects of middle layer’s thickness of V–W–V multilayered film on structure and properties of VOX–WOX–VOX ceramic thin films were investigated. The as-deposited V–W–V multilayered film showed amorphous-like structure when mixed structure of VO2 (M) and VO2 (B) was formed in VOX–WOX–VOX ceramic thin films. Tungsten content of VOX–WOX–VOX ceramic thin films increased with increasing middle layer’s thickness. With increasing middle layer’s thickness, room temperature square resistance (R sq) of VOX–WOX–VOX ceramic thin films increased from 65 to 86 kΩ/sq. The VOX–WOX–VOX ceramic thin film with the thinnest middle layer showed significant SMT (semiconductor–metal transition) when SMT became negligible on increasing middle layer’s thickness.